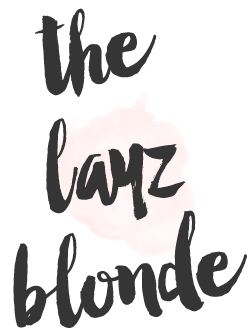 the layz blonde : how I get the perfect shave! I shave in the tub w/ the detachable shower head-since I have a small stand up shower, the tub is a 100% times easier. First things first, I have all of my products out and open, because opening things with wet, slippery hands is not easy. Then I take a big plastic cup and fill it with cold water-I'll explain this later. Next, I wet one leg: if you're doing this like me-sitting on the side of the tub, wet one leg at a time to make it easier to work between legs and not get super wet & messy. Then I go in with a scrub to get all the dry, dead skin off-and we all know I'm the driest out there, so I have a lot. I've been using Manna Kanar Relax Champagne Charcoal Scrub which smell amazing and is so gentle. I've used some in the past that when you rinse after it actually hurt to get off. Now it's time to shave! I've been LOVING the glee summer lily shave mousse. This smells like the prettiest flower ever, I can't say enough good things about this mousse. Lather up and dip your razor in the cold water you set aside earlier. Pro tip; using cold water to rinse your razor between each shave will get all the hair out of the razor and it makes your hair easier to shave. The cold water helps to pull more of the hair from the follicle. The joy razor is made by Gillette (& they know razors), it has 5 blades, and the NICEST, rubbery handle that literally is so easy to hold on to. I couldn't believe how comfortable it felt in my hands. Right now, it's only at Walmart, but that means the price is low & at $8.97 for a razor and an additional cartridge, this needs to be in your cart. Extra cartridges will cost between $8-$16 depending if you want 4 or 8! After my leg is hair free, don't rinse just yet, this is the time to go in with oil. Any oil will do, baby oil is the best, but I've using the L'occtane Shower Oil. While I don't like the smell of this (almonds!) I do like how it helps to clog up those hair pores. Now rinse the leg and immediately apply your fave lotion. My go to is the Cetaphil moisturizing cream for very dry, sensetive (me!) skin. *ps-some of these links are affiliate links, so when you use them to shop, I'll get a small commish. Which means me love you long time! **I did receive a small commish to promote this razor on IG, but was not required to do this post...so you know it's good!